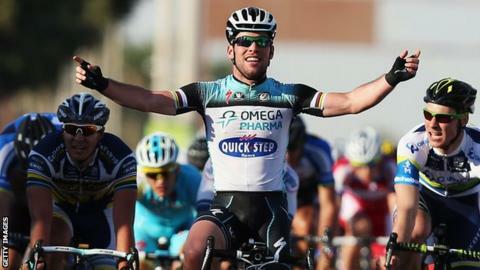 Britain's Mark Cavendish secured the overall lead in the Tour of Qatar with victory on stage four of the race. The 27-year-old crossed the line ahead of Dutchman Barry Markus and Italy's Andrea Guardini to record his third win for new team Omega Pharma-QuickStep. Cavendish now has a two-second lead over former leader Brent Bokwalter heading into the final two stages. Meanwhile, Tour de France champion Bradley Wiggins pulled out of the final stage of the Mallorca Challenge. In Qatar, Cavendish's fellow Briton Adam Blythe was fourth overall after finishing 14th, while Geraint Thomas was 10th overall. The fourth stage was a 160km race from Camel Race Track to Al Khor Corniche. Cavendish felt his results in Qatar back up the decision to part company with Team Sky, who helped drive Wiggins on to success at the Tour de France. "I hope this can continue and we can keep getting good results this year"
"I am really, really happy right now. Three wins already, shows me, and shows team manager Patrick Lefevere, that I made the right move," said Cavendish. "I get along really well with the guys already, and we have a good ambience with the team." Manxman Cavendish beating Markus and Lithuania's Addis Kruopis in a sprint finish on the 143km stage between Al Wakra and Mesaieed. Cavendish's wins were his second and third for his new Belgium-based team, following a victory on the opening stage of the Tour of San Luis in Argentina in January. In Mallorca, Wiggins withdrew with more than 100km of the race remaining. The Englishman struggled in his first outings of the 2013 season, finishing 161st and 152nd out of the 178-strong peloton on the first two days of the race. However, the four-time Olympic gold medallist rebounded on day three, when he led by nearly a minute before being overhauled. Wiggins's Team Sky team-mate Ben Swift crashed on the final descent of the 170km stage from Can Picafort to Playa del Muro. Team Sky announced via their Twitter page that Swift had been taken to hospital as a precautionary measure.